This year, you may have a few more reasons to celebrate Mom. The impact of women's earnings, and the financial contributions they make to their families, continues to grow. According to research by the Center for Talent Innovation, U.S. women now have decision-making power over more than $11 trillion, or 39 percent, of the nation's investable assets. in the financial driver’s seat. But women may not be making the most of their increased wealth and financial power. The FINRA Investor Education Foundation's 2015 National Financial Capability Study (NFCS), found that only about 38 percent of female investors are comfortable making investment decisions compared with 52 percent of male investors, and female respondents answered only 3.8 questions out of 10 correctly on an investor literacy quiz (men answered 4.9 correctly). Interestingly, both men and women got the same number of questions wrong (3.4). In other words, women appeared more willing to say “I don't know” rather than guess. Assess your own investor knowledge by taking the FINRA Foundation's quiz. 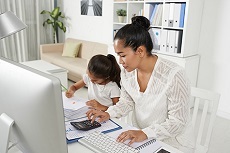 Here are five ways women can take charge of their financial futures. For many of us, getting started on a financial plan can be the hardest part. To get you moving, start by writing down three financial goals you want to accomplish. For example, you might want to purchase a home, start a business or fund a child's college education. Goal setting and goal attainment tend to go hand in hand. Setting your own goals, and setting a timeline for these goals, also helps put you in the financial driver's seat. It's often a good idea to discuss your financial goals with a spouse, partner or good friend, or with a financial professional. This may help you achieve greater clarity about specific investments and strategies that are a good fit for you. Prioritize your goals and set timelines for when you want them to be accomplished. If you feel like you have too much debt, for example, focus first on paying down high-interest credit card balances or loans. Some of your goals will have hard deadlines, like saving for a wedding or paying for a child's first year of college. Others are more flexible, like saving for a special vacation or a home renovation project. Especially for longer-term goals, including funding your retirement, be sure to set interim goals along the way to keep yourself on track. Estimate how much each of your goals will likely cost. Use tools such as retirement and college savings calculators to help estimate these costs. Create separate savings or investment accounts for each of your major goals, and then choose saving and investment options suited to meeting each of your goals based on your time frame and your tolerance for risk. According to the NFCS, 39 percent of female respondents (versus 28 of male respondents) probably or certainly could not come up with $2,000 in the case of a short-term unexpected expense, such as a sickness, job loss, economic downturn or other emergencies. Your inability to pay these expenses makes a bad situation worse if you have to take on debt, and interest payments, to pay the bills. Start by mapping out your cash flow and expenses, and then build a spending plan that includes putting money away each week in an emergency fund. To put it in perspective, if you set aside just $10 each week, you will have saved more than $500 in a year. The best place for your emergency fund is in a liquid (easily accessible) account. A liquid account might be a regular savings account at a bank or credit union that provides some return on your deposit, and from which your funds can still be withdrawn at any time without penalty. To earn a slightly higher interest rate, some people choose a certificate of deposit, or CD, for part of their emergency fund, or a series of CDs of approximately equal value, with one maturing every six months or every year, a strategy called laddering. Life doesn't always go as planned, so it pays to be prepared. Familiarize yourself with key investing concepts, such as diversification, asset allocation and the basics of investment risk. A basic understanding of these major concepts will serve you well throughout your investing life, and may come in handy in the event of an unexpected event. A significant change to your financial situation, such as the death of a spouse or divorce, could leave you in a bind if you have not been involved with the management of your family's finances and investment portfolio. For example, researchers at Bowling Green State University in Ohio found that the divorce rate among people 50 and older has doubled in the past 20 years. This trend, often referred to as “gray divorce,” is of particular concern for women. Women suffer the most economically in gray divorce, with 27 percent of gray divorced women classified as poor, compared to 11 percent of gray divorced men. There are also happier reasons to get involved in family finances: Research funded by the FINRA Foundation found higher levels of wealth accumulation among households where spouses regularly communicated about money matters. So talk to your spouse about money. There are many ways to invest your money and these options continue to grow with new technologies and offerings by financial firms. Working with a qualified investment professional is one option. These professionals can help guide you through the process of making investment decisions, assist with financial goal setting and keep you informed about how the economy and financial markets are affecting your investment portfolio. There are many types of investment professionals—including brokers, investment advisers and financial planners, so the person or team of professionals you work with will depend on the type of financial help you seek. Before you sign on with an investment professional, be sure to use FINRA BrokerCheck, a free tool to research the background and experience of financial brokers, advisers and firms. And make sure to ask the right questions. Ask about the type of advice the professional is licensed to provide, any costs and fees associated with their services and how they are compensated. The NFCS found that female investors were less likely than men to ask their professional how they are compensated, 42 percent versus 51 percent of men. Your goal is to be an informed investor. Americans are living longer, especially women. According to Social Security Administration data, on average, a female retiring at age 65 can expect to live another 20 years, 2 years longer than a man the same age. And that is just the average, many will live even longer. This increased longevity may explain why 59 percent of female respondents to FINRA's NFCS reported being worried about running out of money in retirement. Saving for retirement, and managing income once you retire, are two important aspects of personal financial management, and the earlier you start saving, the better off you will be. Tax-advantaged options such as a 401(k) or IRA can be smart choices for retirement savings. In addition to potential tax benefits, there is an opportunity for your savings to compound over time. Retirement experts often suggest a savings rate of 10 percent or more to adequately fund retirement. Whether you are funding your own retirement or counting on a spouse's retirement savings, it's essential to understand the investments in your retirement portfolio. This includes how you can make or lose money, and how readily accessible this money is when and if you need it. As you get older, how you chose to invest will likely change. You may find it necessary to change your asset allocation, for instance into investments that are less subject to market ups and downs. Once you retire, the way you manage your income and benefits such as Social Security can mean the difference between living comfortably in retirement, and running short of money down the road. Take the time to get a firm handle on living expenses, spending priorities and how to make the most strategic use of your sources of retirement income. The sooner you do so, the more financially comfortable you are likely to be in retirement. Subscribe to FINRA's Investor News newsletter for more information about saving and investing.